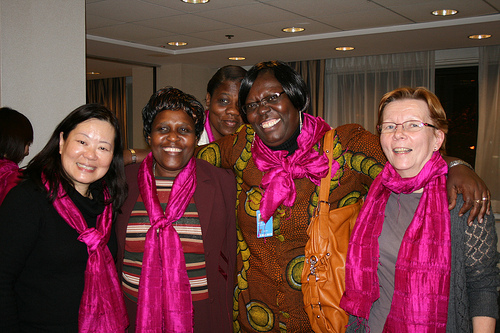 On the eve of CSW 2010, World YWCA President Susan Brennan and World General Secretary Nyaradzayi Gumbonzvanda shared a meal with YWCA Presidents and General Secretaries from around the world. It was amazing to have so many fantastic leaders in one room, some who had been with the Y for decades, others from months – but all united in the common purpose of working through the YWCA to change the world through the empowerment of women and girls. Nyaradzayi spoke of how “the YWCA starts with the Y” as we looked at one of our key messages at CSW – working for greater global investment in young women’s leadership. Investing in young women’s leadership is essential to social change now and for the future. I am proud to be part of a movement that believes in the development of young women and respects leadership of a diversity of women. Nyaradzayi also told us, many at our first UN event, that CSW is a market place of new knowledge and new opportunities” and I certainly looking forward to ‘shopping’ in this market place over the coming days.